Two or so decades ago the old ‘wasteland’  that was early television emerged as a vastly creative venue for the new field of broadcast design. This fertile terra firma of a more standards-conscious industry so flowered with opportunities for graphic designers that the design of television interstices, bumpers, billboards and on-air promotions – the meat of broadcast design – occasionally surpasses actual programmes in terms of innovation. 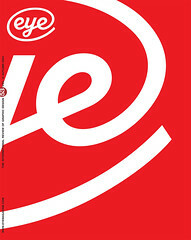 Scott Stowell, who interned with M&CO before graduating in 1990 with a degree in graphic design from Rhode Island School of Design and was later the art director for Colors in Rome, caught the broadcast design bug while assisting Tibor Kalman and Emily Oberman (now of Number 17, see Eye no. 39 vol. 10) on the 1988 Talking Heads’ ‘Nothing But Flowers’ music video – a milestone of pre-computer (paste-and-shoot) motion typography. Once the computer emerged, Stowell started experimenting with new ways of making type cavort and emote on screen without resorting to faddish technical tricks. Motion graphics currently consumes a sizeable portion of Stowell’s practice, and he has introduced some innovative ideas to broadcast design, rooted in Modernist aesthetics and postmodern irony. The highlights on Stowell’s reel include: on-air redesign for the vintage TV channel Nick at Nite (in collaboration with illustrator Chip Wass), combining Modern typography and a UPA cartoon styling; a promotional film commissioned by Fallon McGilogot for Time magazine, harnessing the hypnotic potential of quick-cut animation; and an opening title sequence for Public Broadcasting’s contemporary art programme art:21, a ballet of whirling lines and adjectival words that gracefully fade on and off the screen, and which pays homage to a genre of 1960s experimental, abstract, animated film. Much of Stowell’s work references design and pop history, yet never devolves into pastiche. Working at M&CO and Colors informed Stowell’s current output, if only in spirit. ‘Tibor Kalman mainly taught that there was no reason to do anything the way it’s always been done, and that good enough is never actually good enough when it can be done better,’ says the soft-spoken Stowell. But like other M&CO alumni, Stowell is not a Kalman clone. ‘The big difference between my point of view and Tibor’s is that while he was reactive, working in response to what he thought was wrong with the world, I prefer to be active – we already know what’s wrong, so let’s do things the right way,’ he adds. For several years now, between conceptualising covers for The Nation magazine and designing Moving Image Quarterly, as well as books and music packages such as The Best of Broadside 1962-1988, Open’s most ambitious commission has been conceiving, designing and producing the on- and off-air identity for an idiosyncratic arts and culture cable channel named Trio (recently acquired by the US network NBC), which re-mixes late-twentieth century wasteland artefacts – rare re-run TV shows – and loftier cultural coverage into an eclectic melange that Lauren Zalaznick, Trio’s president, calls ‘slices of pop culture’. Trio’s pre-packaged and original programming include entire weeks devoted to such themes as flops on television and film; censored and taboo TV shows; unsuccessful and unaired TV pilots; and recently, a series on African-American pop culture called The N-Word. Open’s minimalist sensibility nicely complements Trio’s quirky cultural attitude. Stowell’s most indispensable asset is language – provocative wordplay – witty, humorous, silly. It is also the cornerstone of the Trio campaign. Trio’s linguistic brio is precisely what makes it one of the most memorable (and entertaining) on cable. And when compared to other identities in a medium infatuated with flying logos and ham-fisted slogans, Open’s Trio campaign outperforms almost anything the major networks (ABC, CBS, NBC and Fox) have offered. Not bad for a design company that had never created a full-scale television identity before. The book introduced a design language that linked a trio of emblematic nouns (a tagline, statement of purpose, and caption all rolled into one) to the existing red and white circular Trio logo, which was originally designed by Number 17. It was a simple idea but perfectly on the mark. The official (or so-called ‘hero’) nouns – ‘pop, culture, TV’ – stacked flush left next to the logo on three lines and set in Tobias Frere-Jones’s custom version of Gotham, define the fundamental Trio mission. The word combinations are designed to change frequently, depending on the nature of the programmes presented. Stowell notes the additional words can be ‘sly’ or playful references to the different assets the channel has to offer. Among a seemingly infinite number of optional three-word combinations these are a few of the best: ‘songs, stories, TV’; ‘stars, co-stars, TV’; and ‘lights, camera, TV’; ‘gossip, scandal, TV’. The most candid of them all, and my favourite, is ‘ads, programs, TV’. But the Open design police do not sanction all potential combinations. For example, faddish combos such as ‘hip, smart, TV, or cultural combos such as ‘painting, sculpture, TV’, or even random thoughts such as ‘fame, fortune, TV’ are verboten, either because they are too pretentious or they just don’t parse well enough. ‘Open’s pitch went further than just designing a look for our network,’ explains Jane Olsen, creative director of Trio. ‘Scott and his group created something that brought the network to life for the viewer. They didn’t just "make it look nice". They demonstrated an understanding of what the network was about and worked as true partners with us to bring it to life.’ The Trio work also appears to do more than reflect a corporate brand aesthetic: ‘It’s really become part of the DNA of the network. It contextualises everything on the network, which is the thing that makes Trio stand apart from other channels,’ Olsen adds. Stowell insists that Open’s print sensibility has influenced the Trio work. He says The Nation covers, with their stark, no-nonsense, polemical stands, have influenced Trio ‘in the sense that they were presenting specific ideas and developing an overall voice at the same time.’ A lot of the formal ideas evolved from their Nick at Nite work. But the Trio project owes a lot to work for EarthAction, a global network of individuals, non-profit organisations and legislators who work together on human rights, HIV / AIDS, poverty, disarmament and climate change. ‘In both cases the way the work is written is as important as (and inseparable from) the way it looks. That kind of integration makes sense to me,’ explains Stowell. Open has given Trio its distinctive character, in part, through a fusion of unadorned typography and deadpan photography that frames and communicates a collection of covertly ironic messages. This formula is employed by some other cable channels, but Trio’s manner is not as self-consciously cool as MTV, VH-1, E!, or as stubbornly retro as Nickelodeon or Turner Classic Movies. By rejecting the usual television hyperbole it makes a unique statement. And with so many cable alternatives vying for attention, Stowell instinctively understood that Trio should not appear to be so starved for viewers that they beg for their attention. Rather viewers must be made to feel they are invited into a special on-air club. So the simple but novel lure – the concept that won Open the commission in the first place – is the ‘reveal’ of the station’s back story; its matter-of-fact truths, like the fact that a number of Trio’s offerings are actually repackaged re-runs (or never-runs, the underbelly of the broadcast beast). Open accomplishes this with ‘honest’ graphics, like the billboard that says, ‘This next show is a re-run, but we think you’ll still like it.’ And speaking of straightforwardness, one billboard that cracks me up whenever it comes on air is, ‘We’re sorry, but there seems to be a problem,’ composed against a registration colour bar with the Trio logo upside down. Since today’s audiences obsessively channel surf (or set their TIVOs on automatic) and may not catch the same airwave again for days or weeks, Trio defines itself as a terminal destination. ‘We treat our audience as all the people we communicate with, not just the television viewers,’ confirms Lauren Zalaznick. ‘Open gave us a visual toolkit to work with that provided a comprehensive “communication system” that works for on-air promotion, online, off-air marketing, corporate letterhead, corporate merchandise, and everything in between.’ So by enabling Trio to exhibit transparently its quirks, Open has helped make the channel a hang-out, rather than a temporary pause along the surfing circuit. So far the ‘B’ word has not been used. Yet some readers might well ask what’s the difference between this and any other successful branding strategy? Well, number one on Open’s ‘Eleven things … ’ manifesto, under the title ‘No Branding’, suggests otherwise: ‘“Branding” is a kind of trendy idea that involves consultants telling you who you are and what you should look like. Companies like Apple or Ben & Jerry’s or Ikea aren’t good “brands”, they’re just good companies with good products. How they communicate is a natural consequence of who they are, in the same way that your clothes, your house or the way you talk express who you are. When we develop identity systems for our clients, it’s our job to help this process along.’ Okay, it may not be branding according Open, but to borrow Stowell’s words ‘it is what it is’. And what it is works. 2. www.notclosed.com/pages/weare/weare_people.html and click on ‘Read about’.